2012 marks 350 years since the publication of the Book of Common Prayer that remains in use to this day. The publication followed on from previous work to produce a book of structured services in 1549. This first book, published in the reign of Edward VI, followed the break with the Roman Catholic Church. It contained forms of service for daily worship in English. In addition to daily services, the 1549 publication also contained the liturgy for occasional services such as the order for Baptism, Marriage and a Funeral Service. There soon followed a revision in 1552 but that never came into use because, following the death of Edward VI, his half-sister Queen Mary restored Roman Catholic worship. Another revised edition was published in 1559 after Mary’s death. 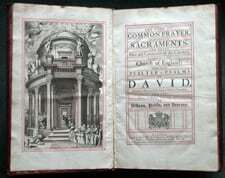 Following the Civil War in the next century another major revision was published in 1662 and it is this edition that has remained the official prayer book of the Church of England ever since. 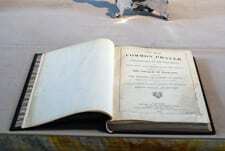 On 19 May 1662 Royal assent was granted prior to the Prayer Book coming into use later in the year. At St George’s Chapel the anniversary will be remembered and marked in Services, particularly Mattins at 10.45, on Sunday 20 May 2012. The Sermon at Mattins will reflect the place of the Prayer Book in Anglican Church life. 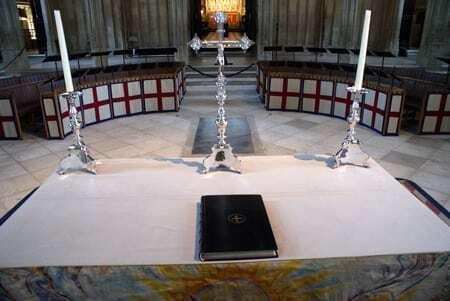 The photograph shows a Book of Common Prayer on the Nave Altar. St George’s Chapter Library contains Prayer Books from 1594, 1614 and 1706. The latter, which is the nearest in date to the new version published in 1662 is illustrated on the left. For more information about Services please click here and for more information about the Archives please click here.